This new 11-meter vessel was specifically built and customized for large whale response, disentanglement and research for the Hawaiian Islands Humpback Whale National Marine Sanctuary. Based in the heart of the sanctuary, the vessel's homeport will be primarily in Maui at Ma'alaea Harbor near the sanctuary's Kīhei facilities. True turn-key response boat ready to respond immediately. Built-in storage for 15-foot rapid deployment inflatable. Davit for lifting heavy equipment. Custom designed upper helm station provides the boat operator with excellent visibility for safe operation around whales. Versatile platform for tagging, observation, health assessment and response to marine mammals in distress. Support for research and monitoring of fish, corals and maritime heritage resources through dive ops by cooperating partners. 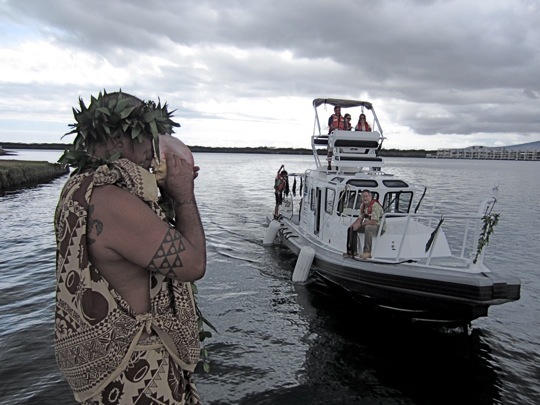 Download a one page information sheet about the Koholā vessel. 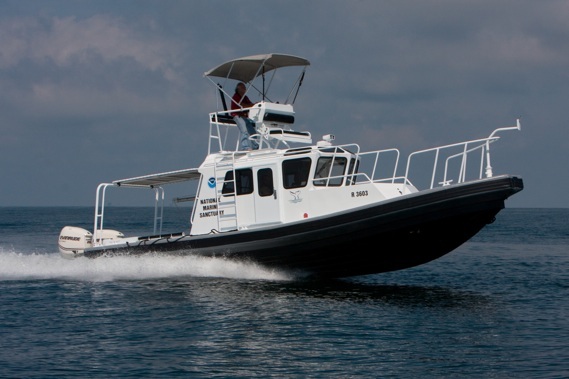 Watch a video about the National Marine Sanctuaries Small Boat Program. Hawaiian practitioner Kimokeo Kapahulehua blesses the Koholā.